Sharon and Jess knocked on the door. No one answered. "Where are they?" said Sharon impatiently. She called through the door, "Luperusse! Skeithena! WE'RE BACK! Hello? Hello? Hello?" "Maybe," said Sharon, typing her password into a code box on her door. The door clicked open. Sharon breathed a sigh of relief. "At least now I know I haven't been hacked." The two friends walked into the NeoHome, calling their pets' names. But there was no answer. They searched every room, and found nothing. Sharon slumped down on her Blue Bean Bag Chair unhappily. "They're nowhere! Maybe the hacker just took my pets and went away...I mean, Luperusse has good Battledome statistics, and Skeithena has high intelligence...maybe the hacker just wanted good pets...yes, a hacker took my pets!" "Without even taking your items, furniture, Neopoints, and all that stuff? Hmm...I don't think so," answered Jess grimly. "So, which one of you will agree to be my slave in exchange for an Air Faerie Sword? 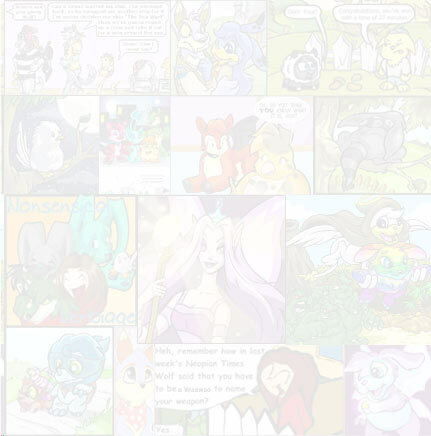 Come on, young NeoPets, time is running out!" Jhudora urged Skeithena and Luperusse." "Hang on," said Skeithena quickly, "I want to discuss it with Luperusse first." "Fine!" Jhudora snarled. "But you better be quick about it, or else you don't get any Sword!" "Luperusse," Skeithena whispered, "I've got an idea that might help us!" The Lupe was very grumpy, as he usually was when he was in danger. Not that being grumpy helped a lot. "Oh, you mean a good idea like the one that you had when you decided we should go to the Hidden Tower and borrow items?" he said sarcastically. Skeithena ignored Luperusse's remark - she was quite used to his grumpiness. "Listen! We can - oh, never mind," she said, as, out of the corner of her eye, she watched Jhudora show signs of impatience, "just give me your Ice and Fire Blade!" Before he could reply, Skeithena grabbed Luperusse's blade, and took a Jhudora the Dark Faerie Doll (complete with a little tag saying Cost: 1,500,000 NP. Fyora was very reluctant to put this in the Hidden Tower) from the shelf. She faced Jhudora. "Aww," cried Jhudora, losing control of herself. "Look at the cute little Faerie Doll, a doll that looks like me! Oh, please, Skeith, don't do anything to it! I won't be able to bear you ripping my Faerie Doll up! Please! I'll even give you my Air Faerie Sword!" 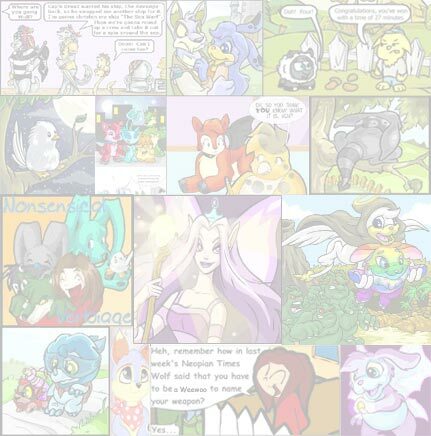 They (Jhudora, Fluffy, Luperusse and Skeithena) finally arrived in Jhudora's Cloud. "Go on!" said Skeithena irritably, still holding the Jhudora the Dark Faerie Doll a fraction away from the Ice and Fire Blade. The Blade was far heavier than the light-as-a-feather Air Faerie Sword, and her paws were beginning to get tired. "Give us your Air Faerie Sword. Now!" "Okay, okay! Just don't damage the poor little doll!" squealed Jhudora, handing Skeithena the Air Faerie Sword. Jhudora took the Faerie Doll and held it in her hands like a baby Usul playing with its Usuki sets. "Give us Fluffy, too," insisted Luperusse. "No! I keep my promises, but I have my limits! I didn't say that I'd give you Fluffy; I just said that I'd give you the Air Faerie Sword! You won't have Fluffy as long as I can stop you!" cried Jhudora, her powerful Dark Faerie Wand in hand. "Oh, so you're saying you're gonna fight us? Well, let's go!" cried Luperusse happily. He loved the Battledome. "No offence meant, Skeithena, but I'm better in the Battledome than you are (even though you're fast) - so I'll fight!" "No offence taken," answered Skeithena. "You go, Luperusse! You can do it, brother!" Luperusse aimed his Sword at Jhudora's leg, while at the same time dodging a blast from her Wand. The Lupe's blow had hit. Jhudora howled in agony, "MY LEG! MY LEG! MY PRECIOUS LEG!" She limped towards her ex-slave, and hit him in the tail with her Wand. "That hurt!" growled Luperusse, grabbing his tail. Jhudora saw her chance and snatched the Sword from him, and threw it away. The Lupe didn't bother to look at the Sword. He was an experienced battler, and knew that if he hesitated any more, Jhudora would do even more damage. He let go of his tail and bit hard into Jhudora's wing, and the evil Faerie fainted! The ex-Jhudora slave kicked the knocked-out Jhudora aside. "So, Skeithena, did you save the Sword?" "Yup," said Skeithena proudly. "You did great fighting Jhudora. That was a really good fight!" "A really good fight? Oh, that reminds me. I'll have to have another fight..." Luperusse quickly backed away from a snarling Fluffy. "...Another fight with Fluffy, to be precise..."
"I don't think we can help at all by knocking her out," sighed Skeithena. "We'll just have to find some way of subduing her, and then...and then we'll have to make her back to normal! After we get her back to normal, we'll give the Sword back to Fyora..."
Luperusse had started to run round and round the room, with Fluffy close behind. "What you say isn't as easy as it sounds. Especially the subduing bit," he added, as Fluffy snapped at his tail. "Crates!" cried Skeithena. After quite a struggle (which included Fluffy biting Luperusse's tail), the two managed to get Fluffy in one of Jhudora's crates. After giving Jhudora a sharp poke from the Air Faerie Sword, to make sure that she wouldn't wake up and follow them again, they set off, carrying the crate between them. Jess tried desperately to cheer Sharon up. "The first time Skeithena and Luperusse baby-sat Fluffy, they acted like they'd had an adventure or something and didn't want to tell us...they're probably out on one of those adventures now, and they'll come back soon, so all we have to do is wait - "
"Yeah, those two are probably having a very pleasant adventure with a hacker right now," said Sharon, her head in her hands. "Don't think like that, Sharon!" cried Jess, who then decided that she'd change the subject. She suddenly glanced at her watch. "Oh! It's already ten past three NST! I think we should go have lunch now, Sharon, you've missed lunch worrying about your poor little NeoPets..." Jess went into the kitchen, and opened the refrigerator. "Let's see what's in here, hmm? Okay, some Mushy Musho Peas, delicious!" Actually, Jess despised Musho Peas, but she knew that Sharon was a poor Neopian and that it wasn't the right time to groan about what sort of food there was in her refrigerator. Jessica divided the can of Musho Peas into two portions, and passed one to Sharon. "Come on, Sharon, let's have lunch! Yum, yum, Mushy Musho Peas!" "No, Jess," said Sharon, not looking up. "I'm not going to eat until I know that Luperusse and Skeithena are safe." Everywhere you look, they're there. When you think about how many citizens Neopia has, how can you know who they are? It was times like these when she would rather be at home, curled up by the fire with a book, and Sys-op, her pink Kadoatie, of course.